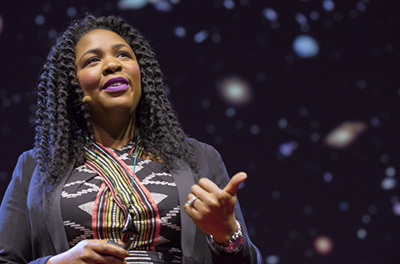 Award-winning astrophysicist Jedidah Isler will give a free public lecture entitled "Blazars: Nature's particle accelerators" on Thursday, June 7, at 7:30 p.m. at the Rio Theatre in Santa Cruz. Blazars are supermassive, hyperactive black holes found at the cores of large galaxies, feeding on gas, dust, and space debris. Each blazar's insatiable diet generates a spectacular firework-like cocktail of shooting light beams and jets of charged particles moving at nearly the speed of light. Isler's research on blazars focuses on understanding the physical mechanisms responsible for the highest energy radiation emitted by blazar particle jets. Isler is an award-winning astrophysicist, TED Fellow, National Geographic Explorer, and nationally recognized speaker and advocate for inclusive STEM education. Born in Virginia Beach, Virginia, she received a master's degree in physics from Fisk-Vanderbilt and became the first African-American woman to receive a Ph.D. in astrophysics from Yale University. Isler is currently a National Science Foundation Astronomy & Astrophysics Postdoctoral Fellow at Vanderbilt University. The Mandel Lecture Series, generously sponsored by Steve Mandel and Carol Foote, promotes public awareness and appreciation for astronomy. For more information about this lecture, contact sciences@ucsc.edu.